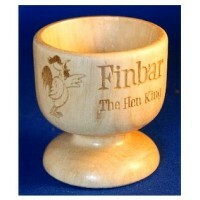 Wooden egg cups in Beech wood, engraved as Wedding Favours or Party Favours. You can have all the in.. 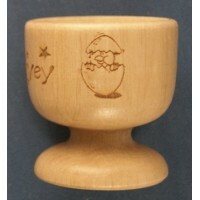 Wooden egg cups personalised in laser engraving with designs on opposite sides. Just let us know you.. 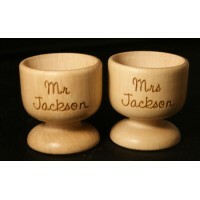 Wooden egg cups, engraved with a short name or phrase. Most popular for Easter gifts or Stocking Fil.. 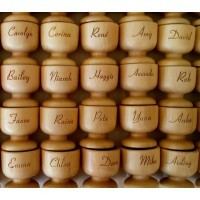 Wooden egg cups engraved with a name and image. Just choose a style of font and image from those s..